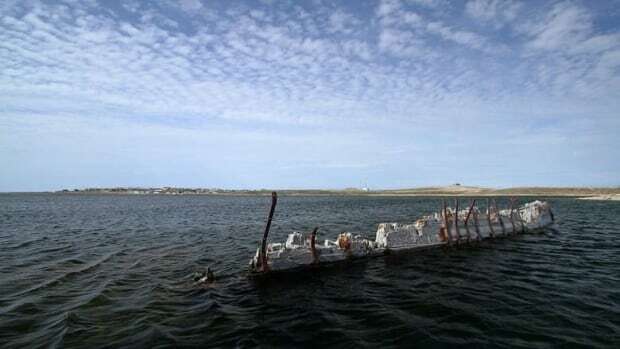 A ship that once belonged to Arctic explorer Roald Amundsen will not be moved from Cambridge Bay this year, despite a Norwegian group's plans to salvage the Maud this summer. The Maud has been partially submerged in the waters near the community for more than 80 years. The Norwegian group Maud Returns Home plans to move it back to the town where it was built a century ago. But ice in the Northwest Passage has delayed a tug and a special submersible barge arriving from Norway. The vessels left Norway in the middle of June to make the 7,000-kilometre trip. They should arrive in Cambridge Bay on the weekend but that may not leave enough time to raise the ship. "Most likely we will not be able to lift Maud before the freeze up," said Jan Wanggaard. "We will just do some preliminary testing of the principles and then we will wait until next year in the spring to do the lifting operation. That's how I think it will happen now." Wanggaard has been in Cambridge Bay for several weeks. He and another diver are clearing away the loose material and debris around the Maud.